Segment makes it easy to send your data to Twitter Ads (and lots of other destinations). Once you've tracked your data through our open source libraries we'll translate and route your data to Twitter Ads in the format they understand. Learn more about how to use Twitter Ads with Segment. Our Twitter Ads destination code is all open-source on GitHub if you want to check it out. From your Segment Destinations page click on Twitter Ads. Twitter Ads can track conversions in two ways. You can opt to use their newest Universal Website Tag or their Single Event Website Tag. You could also use both types of tags on the same page. If you’d like to use the Single Event Website Tags, you must map the Segment events to your tags’ respective conversion pixel IDs. The Single Event Website Tag is good to use if your event names do not match the Segment supported events with the Universal Website Tag. If you are using the Universal Website Tag, when you call .page() we will fire a standard pageview event using Twitter’s JS library: window.twq('track', 'PageView') as seen in their auto generated snippet. If you are only using Single Event Website Tags, we will load their standard pageview pixel with default query values (revenue: 0, quantity: 0) given that you have provided the Page Pixel in your Segment settings for Twitter Ads. If you have both tags defined in your destination settings, we will load both the single event pixel as well as the use the universal JS library to send the pageview event. Each time you track an event from the browser with our Twitter Ads destination enabled we compare the event name to the events you have mapped to Twitter Conversion IDs inside of Segment. If the event being tracked corresponds to a Twitter conversion, a Twitter conversion pixel will be loaded on that page with the ID that you mapped it to. We will fire a Twitter conversion pixel for you with a Twitter Conversion ID of 28j3fo. It doesn’t matter what you call the conversion inside of Twitter Ads as long as you paste your Twitter Conversion ID next to the right event in Segment. If you include properties.quantity and properties.revenue with your events, we will send that along as parameters of the conversion tag. If these two properties are not provided, we will send the two parameters as 0. Our Twitter destination supports Advanced Conversion Tracking which can be used to run Dynamic Ads Campaigns. Once you create your conversion events using Universal Website Tag inside Twitter’s UI, just follow our Ecommerce V2 Spec and we will automatically map select events (listed below). Keep in mind that you must provide the Universal Website Pixel ID in your settings for this feature to work. NOTE: For each of these Segment events, we will still check if you had mapped any of them to a Single Event Website Tag in your Segment settings and fire those tags in addition to these advanced conversion tags. You can choose in your Segment settings if you want to populate content_ids parameter with your product_id(s) or sku(s). Whatever you choose should match the IDs in your Product Feed if you are running dynamic ads. content_type will always be correctly hardcoded to be 'product'. content_name and content_category for multiple products will be concecatenated delimited by commas. num_items represents the sum total of all your products’ respective quantities. value, currency, order_id and num_items will not be mapped for any pre-purchase tags because it will attribute revenue, which is undesired behavior for ecommerce/retail businesses. The following code snippets represent the code we would fire under the hood on your webpage given an example Segment event. NOTE: The following assumes that the setting for Product Identifier is product ID (it can also be SKU). NOTE: Since no parameters are required for this tag and its supported ones do not correspond with this spec’d event’s properties, we will not map any properties for this tag other than properties.status. NOTE: Since no parameters are required for this tag and its supported ones do not correspond with this spec’d event’s properties, we will not map any properties for this tag. Twitter recognizes pixel ids, not custom events. 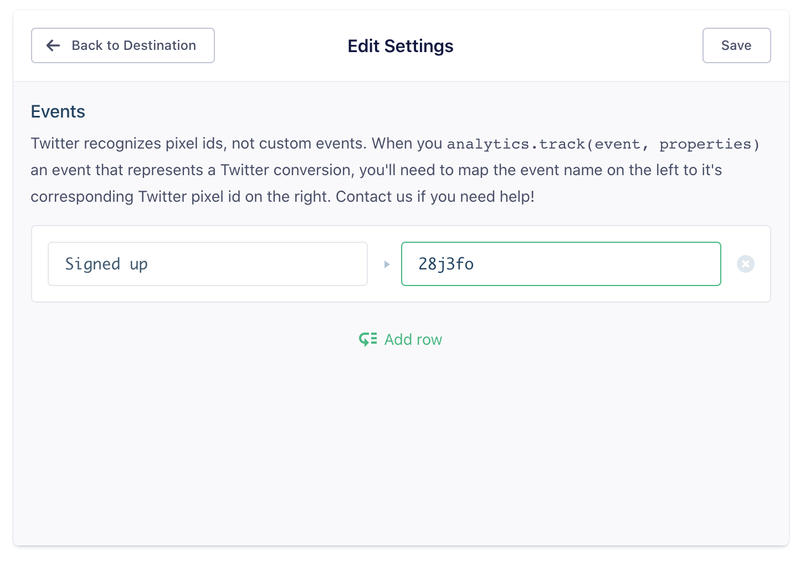 When you analytics.track(event, properties) an event that represents a Twitter conversion, you’ll need to map the event name on the left to it’s corresponding Twitter pixel id on the right. Email friends@segment.com if you need help! If you are using Advanced Conversion Tracking, you can choose to send Product IDs or SKUs as the content_ids. Whatever you choose should match the IDs in your Product Feed if you are running dynamic ads. Twitter recognizes pixel ids. This is just a special pixel id you can use for page views. It will get executed on any call to analytics.page(). Twitter supports having a single universal website tag for conversions. Please enter your Universal Website Tag Pixel ID. This setting is also required in order to use Advanced Conversion Tracking.